Tsugumi Umatachi (馬立　ツグミ, Umatachi Tsugumi) is a grumpy eggplant-jockey. They were hired by Fujiwara no Iyozane to help Taira no Fumikado with their plans to become an emperor. Tsugumi used to be a farmer who breeds vegetables before they were recruited by Iyozane to help Fumikado to become emperor. Tsugumi is a very responsible youkai that uses coarse language, appearing to be a foil to Iyozane's airheaded, jovial nature. They speak in a heavy Kansai dialect. Though they have a quick temper and their attitude is rough, they are actually a very humble person and value hard work. Tsugumi has the ability to turn anything they sit on into a vehicle. 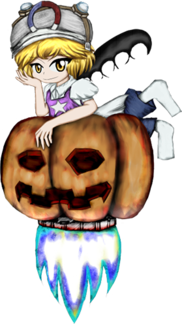 In Reactivate Majestical Imperial they sit on a obon eggplant, and in Brilliant Pagoda or Haze Castle, they sit on a propelled pumpkin. According to JynX, they tried to use their ability to transform it into a pumpkin carriage, Cinderella-style. But for some reason, it transformed into a rocket-propelled pumpkin instead. Their character may be a homage to Soga no Tojiko , because both are grumpy and have light-based attacks and both are the servant to a character from a royal lineage who cheated death. Their full name is Tsugumi Umatachi (馬立　ツグミ). "Tsugumi" (ツグミ) is the Japanese word for thrush, a type of bird. "Umatachi" (馬立) means "getting on a horse". According to JynX, "Tsugumi" is written as "噤美" in Chinese. 噤 means "to shut one's mouth and keep silent" or "to have one's teeth chatter from shivering", while 美 means "beauty", "beautiful", "delicious", "to beautify" or "to praise". While 噤美 is not a standard vocabulary, it may mean "silent beauty". Tsugumi has short blond hair and yellow eyes. They wear a strange jockey hat with goggles on it. They have black feathered wings on their back. 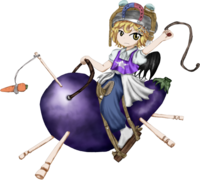 The eggplant that Tsugumi rides on is part of an Obon tradition, in which one decorates eggplants and cucumbers to resemble cows and horses. The makeshift steeds are meant to symbolize the spirits of one's ancestors riding into the afterlife. Tsugumi was hired to herd the spirits by Fujiwara no Iyozane, in order to use them to resurrect Taira no Masakado. On the way to the Gloomy Straits, they run into the heroes who proceed to make fun of their appearance. Offended, they attack the heroes, but they are defeated. While Yabusame and Tsubakura are flying across the river, they’re ambushed by Tsugumi, who orders them to go home since they’re interrupting their job to herd the spirits. Yabusame is hungry and wants to eat the big eggplant Tsugumi is riding. In order to protect their vehicle, Tsugumi attacks them, but is defeated. Like in the previous scenario, Tsugumi asks the heroes to go home, since their presence disrupts the spirits. Sukune asks if they are the mastermind, but Yaorochi notices that Tsugumi is just a mook. Offended and wanting to finish their job already, Tsugumi attacks them, but is defeated. Tsugumi encounters Kuroji and Saragimaru, who proceed to make fun of the eggplant they are riding. Kuroji comments that such a big eggplant would be very valuable and proceeds to fight Tsugumi in order to get it. After the fight, Kuroji loses interest and flies away. Tsugumi becomes a playable character in Brilliant Pagoda or Haze Castle and teams up with Fujiwara no Iyozane and Taira no Fumikado. Having been promised a reward by a desperate Iyozane (who is starting to regret allying with Fumikado), Tsugumi tags along with their group. They may also appear as a possible stage 2 boss on the neutral route. In addition to being Fujiwara no Iyozane's supervisor/partner, they're also their friend whom they sometimes bicker with. They both have trouble understanding Fumikado's ambitions, but obey them nonetheless. Tsugumi seems to be currently hired by them. Tsugumi only serves Fumikado because they were hired by Iyozane to do so. The two have been depicted having snark conversations and while normally Fumikado doesn't tolerate insults or sarcastic comments at their persona, they normally tolerate Tsugumi. It's implied that unlike Iyozane, who serves Fumikado out of ambition, Tsugumi serves them out of business. Notably, both Xeno a and Suzumi Kuzu have noted that Tsugumi had once "meddled with Tsurubami's affairs" in the past, implying that there is some sort of vitriolic relationship between Tsugumi and Tsurubami. Illustration of Tsugumi with Fumikado and Iyozane for Len'en Project's 2nd anniversary. A lot of their attributes including their grumpy attitude, riding skill, rotational attacks and fast movement make Tsugumi a fairly clear parallel to Johnny Joestar of JoJo's Bizarre Adventure. They even wear similar clothes and star motifs. A regional name for the dusky thrush in the Kanto region is chouma (鳥馬), literally meaning "bird horse". This may be the inspiration behind Tsugumi's jockey theme. This page was last edited on 21 November 2018, at 07:36.